The video appears to show a man wearing Khashoggi's clothes leaving Saudi diplomatic offices on October 2 with another person. CNN said Turkish law enforcement cameras recorded the video. CNN said the video suggests someone was pretending to be Khashoggi, possibly to hide the killing. Turkish state-run broadcaster TRT also reported that a man wearing Khashoggi's clothes left the consulate building. Saudi Arabian officials have changed their explanation about Khashoggi's disappearance several times. He told supporters in Istanbul Sunday, "We are looking for justice here..." and that the truth would be told. In addition, Erdogan spoke to American President Donald Trump by telephone on Sunday. Turkish state-run media said the two agreed that the Khashoggi case needed to be "cleared up." On Sunday, Saudi Arabia's Foreign Minister Adel al-Jubeir said that Khashoggi died in, what he called, a "rogue operation." Al-Jubeir offered sympathies to Khashoggi's family. He said that any attempt to "cover up" wrongdoing was "unacceptable in any government." The foreign minister also denied reports that powerful Crown Prince Mohammed bin Salman was involved. Saudi Arabia says Crown Prince Mohammed bin Salman expressed his sympathy to Khashoggi's son on Monday. They spoke by telephone. News reports have said 15 Saudi agents were involved in the operation. Some people question how a team of 15 Saudi agents could travel to Istanbul without the crown prince's knowledge. Some U.S. lawmakers, including members of the president's Republican Party, have expressed concern about the apparent killing. They are demanding punishment for Saudi Arabia. Khashoggi's family has links to the Saudi Royal family. His father was a Turk who served as the personal doctor to King Abdulaziz Al Saud the founder of Saudi Arabia. Khashoggi has been a reporter since the 1980s. Both sides will strengthen cooperation in judicial and law enforcement. The night he called for me the last time, I cried myself to sleep. Now he holds the office of Foreign Minister. Have you found the book you have been looking for? 5.He said that any attempt to "cover up" wrongdoing was "unacceptable in any government." Lies cannot cover up the facts. Cosmetics do not cover up the deficiencies of nature. 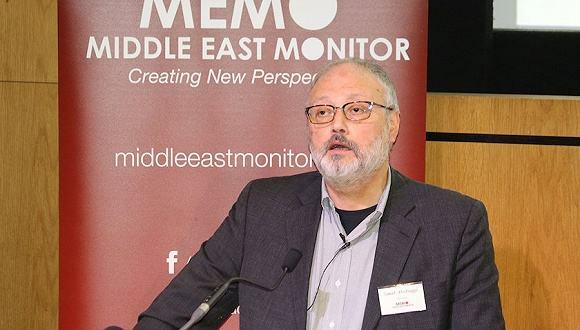 6.Most recently, they have said that Khoshoggi choked to death while being prevented from leaving the consulate to call for help. If I were in the lion’s cage , I’d call for help. This morning on my way to school, I was riding when I heard a call for help.